About Medical Liens provides answers for questions about what medical liens are and what they can do to help you collect payment for medical services you provide. 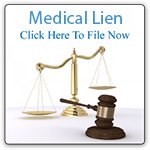 Medical Lien Requirements answers all your questions about the requirements of filing medical liens. An improperly filed lien wastes your time and money. Filing Medical Liens Online is the fastest, least expensive and easiest way to process medical liens. What is a UCC Lien? Southwest Liens, Inc. is not a law firm and does not provide legal advice to customers. Customers with legal questions are advised to consult with a licensed attorney. SWL, Inc. does act as a conduit for communications for level 1 customers only, when those communications are solely related to liens SWL, Inc. has prepared and filed, but does not negotiate or resolve liens or legal issues related to liens.